London: After becoming the first woman player from the sub-continent to ink a deal with English Premier League side (EPL) West Ham United’s ladies team, Aditi Chauhan has added yet another feather to her cap. 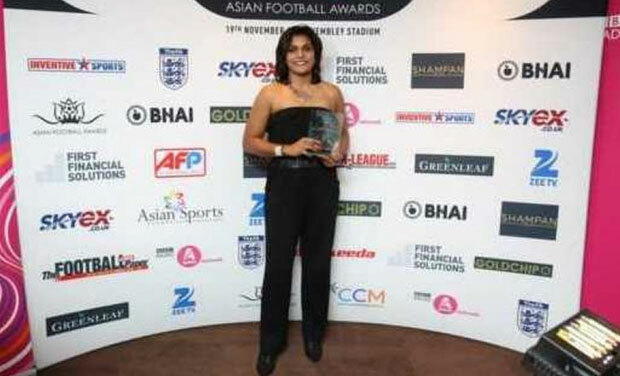 Aditi created history again when she became the first Indian woman to win the Women in Football Award at the third Asian Football Awards in London on Saturday. Aditi, who hails from Delhi kick started her football journey when her school coach asked her to participate in the under-19 team trials. She was appreciated for her contribution to India winning the South Asian Football Federation (SAFF) women's cup in 2013. Currently pursuing her Masters in Sports Management from Loughborough University, she was spotted by Julian, who is West Ham's goalkeeping coach. "This award is all worth it. Getting this award at Wembley is a fairytale, especially for someone who comes from a country that has no league for women. It was not easy to pursue a career in football. I am thankful to West Ham and my family for all the support," an ecstatic Aditi was quoted as saying by a leading Indian daily. The awards are supported by the English Football Association (FA) and the Asian Football Project to recognise achievements of British Asians in football. After getting the much-needed boost, Aditi is confident that she will not give up the sport despite facing visa issues.